Our Estate Riesling from vineyards directly in front of our winery includes the original 1979 planting. High sun exposure and unique soils yield an intensely perfumed and expressive wine exhibiting pure varietal character. Aromas of jasmine flower and marmalade lead to flavors of stone fruits and a pleasing minerality. The fresh acidity and long finish mean you can enjoy watching this wine develop for years. his Willamette Valley Pinot blanc is aged on lees in French Oak barrels for 18 months. A soft, round mouth feel enhances pear and citrus flavors with hints of vanilla, leading to a long, rich finish. Enjoy with a broad range of dishes from roasted chicken to creamy risotto. Grapes were hand-picked and brought directly to the winery in half-ton totes. They were then sorted by hand and whole cluster pressed. The lightly pressed juice was then cold fermented at 45°F for maximum varietal character. The wine was then aged in French oak (10% new) on its lees for eighteen months before bottling. Nose of blackberry, bramble, sweet tobacco, graham, and cardamom. Flavors of sweet dark cherries, forest floor, dark chocolate nibs, blackberry, chai, all finishing with rich, smooth tannins. Great with beef tournedos, roast game hen, pork rillettes, oven roasted vegetables, Peking duck, lamb, venison, chanterelle risotto, or pozole. 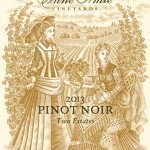 Our Two Estates Pinot Noir is a barrel selection chosen to produce the best reflection each vintage of our Twelve Oaks Estate and Anne Amie Estate vineyards. 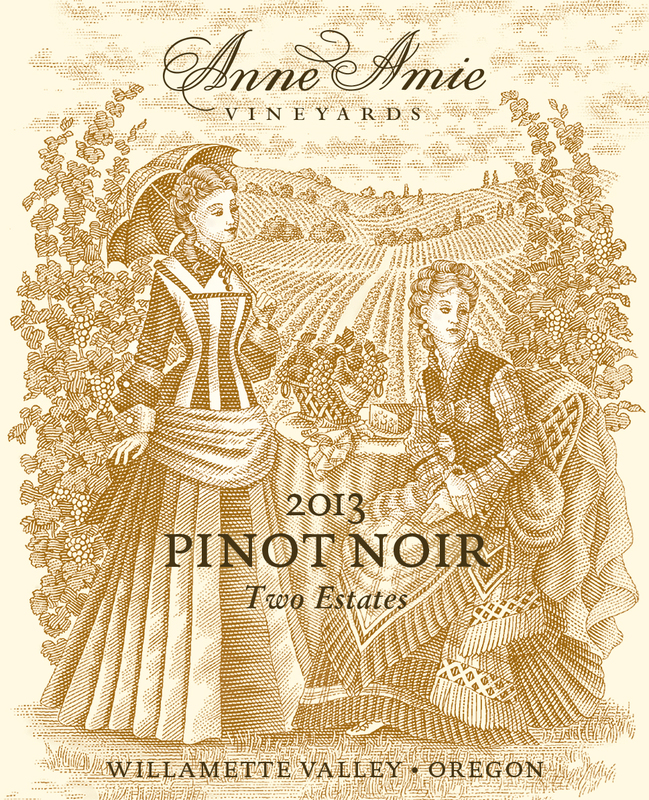 It is a graceful, elegant and restrained Pinot noir, with enough structure for long-term aging. Grapes were hand-picked and brought directly to the winery in 1/2-ton totes in perfect condition. They were then put onto a belted incline, and de-stemmed into two-ton, open-top, stainless steel fermenters. The must was cold-soaked for five days. Fermentation was complete in 10 days, then the wine was pressed back into two-ton tanks, settled overnight and racked into French oak barrels. The wine aged in French oak for 16 months, racked into neutral French oak after 10 months. It was then blended and bottled unfiltered and unfined and bottle-aged for 12 months before release. Aromas of dark cherry, kirsch, horehound, dusty road, crushed gravel, black tea, orange peel precede flavors of Mt. Hood strawberry, black currant, wild cherry, baking spices, and red plum. A structured wine with amples tannins and good acidity. Prismé is the truest expression of the Pinot noir grape. We select only our finest blocks of Pinot noir and gently press the grapes, liberating the free run juice, but not the color or tannins from the skins. It is then barrel-fermented, and aged on its lees in French oak barrels for 18 months. This structured white wine has a backbone of acidity, a voluptuous mid-palate and a long, creamy finish. Prismé is named after the word prism- the splitting of white light into its corresponding colors. Here we are doing precisely that in reverse, making a rich, textured white wine from Pinot noir. Our Anne and Amie Late Harvest Muller Thurgau Dessert wines come as a set to show two different facets of a our 30 year old Estate Vineyard.